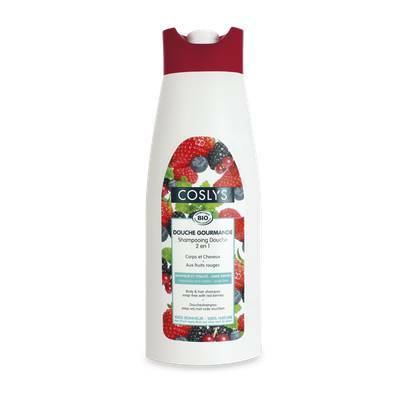 The body and hair shampoo formula with red berries is rich in polyphenols. They come from fruit harvested in France to bring a cocktail of vitamins to your body and hair to start the day with a flourish! Gentle, it makes an unctous foam. Perfect for daily use. Aqua (water), spiraea ulmaria flower water*, sodium coco-sulfate, cocamidopropyl betaine, decyl glucoside, glycerin, rubus idaeus (raspberry) fruit extract*, fragaria vesca (strawberry) fruit extract*, coco-glucoside, glyceryl oleate, sodium chloride, coconut alcohol, sodium sulfate, parfum (fragrance), tetrasodium glutamate diacetate, glycine soja (soybean) oil, tocopherol, dehydroacetic acid, sodium hydroxide, citric acid, sodium benzoate, potassium sorbate, benzyl alcohol, benzyl salicylate, limonene.